Metal panels are a cool addition to your building in more ways than one. 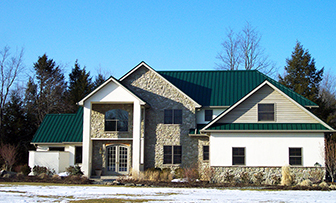 Besides looking great, a metal roof is a simple and effective way to make you more comfortable in warmer months while cutting your energy use and providing potential tax savings. A “cool roof” is one that’s both reflective and emissive. That is, it reflects sunlight and re-radiates absorbed heat back to the sky before that heat can work its way into the structure. Measured surface temperatures of cool roofs are as much as 50 degrees lower than those of conventional roofs so the building’s interior is less prone to heat up, as are any ducts running through the structure. The benefits are obvious: your rooms are naturally cooler and don’t require the air conditioner to work as hard, and you enjoy lower electric bills. In fact, the US Department of Energy (DOE) reports energy savings as high as 15 percent for homes with cool roofs. And if you’re building a new home, a cool roof may reduce construction costs by letting you install a smaller air conditioning system. Cool Metal Roofs are both reflective and emissive. In technical terms, these benefits are thanks to cool metal roofing’s high solar reflectance and high emissivity. The solar reflectance is used in determining ENERGY STAR® compliance. When solar reflectance is calculated with thermal emissivity, in accordance with ASTM E1980, the result is the solar reflectance index or SRI. SRI is stated in whole numbers from 0 to 100, with the higher numbers indicating better performance. Tests done at Lawrence Berkeley National Lab (LBNL) found that metal roofs painted with white coatings have SRIs from 71 to 82. By contrast, white asphalt shingles earn at maximum an SRI range of just 21 to 40. This indicates cool metal roofs perform three to four times better than white asphalt shingles. The LBNL data is for white roofs, but metal has a much wider range of cool colors. Yes, white is more naturally reflective—you will feel cooler on a hot, sunny day when wearing a white shirt as opposed to a black one—but with metal panels, it’s not just about color. A broad range of paints for metal panels have chemical additives that increase their cool properties. If you need any more incentive, there’s another benefit to installing a cool roof. As mentioned in our metal roof tax credits blog, if you re-roof your primary residence using an ENERGY STAR® certified metal roofing product before Dec. 31, 2016, you are eligible to receive a tax credit. And in fact, ABC has 28 colors that are ENERGY STAR qualified for steep-slope roofs. Simply include a copy of the manufacturer’s Certification Statement for those panels with Tax Form 5695 with your tax return to qualify for a $500 tax credit. For more information on ABC’s cool roof products, please visit our website or contact your local representative today.